• The need for improved services in Asia,* is heavily concentrated in Southern and Southeast Asia. These two subregions are home to 58% of Asian women of reproductive age (15–49) but account for 88% of maternal deaths and 86% of newborn deaths in the region. • In Asia, more than half of all women of reproductive age (15–49) want to avoid a pregnancy, a total of 646 million women. However, 20% of women who do not want to become pregnant—132 million in 2017—either use no contraceptive method or use traditional methods, which typically have low levels of effectiveness. These women, who are defined as having an unmet need for modern contraception, account for 84% of all unintended pregnancies in the region. • The number of women with an unmet need for modern contraception in Asia has decreased from 141 million since 2014. • The proportion of women wanting to avoid pregnancy who have an unmet need for modern contraception varies substantially by subregion: 7% in Eastern Asia; 27–29% in Central, Southeast and Southern Asia; 46% in Western Asia; and 55% in Oceania. • Of the 74 million women in Asia who give birth each year, many do not receive the essential components of maternal and newborn care recommended by the World Health Organization (WHO). Overall, just 67% have four or more antenatal care visits, and 79% deliver in a health facility. • The proportion of women giving birth who receive at least four antenatal care visits ranges from 47% in Southern Asia to 96% in Eastern Asia; the proportion is 66% in Western Asia, 77% in Central Asia and 84% in both Southeast Asia and Oceania. The percentage of women who deliver in a health facility varies from 49% in Oceania to 93–100% in Central and Eastern Asia; in Southern, Southeastern and Western Asia, the proportion is 71–77%. • Only one-third (38%) of women and newborns in Asia who need care for complications of pregnancy and delivery receive it. • Each year in the region, 90,000 women die from complications of birth, abortion or miscarriage, and 1.5 million babies die in the first month of life. Most of these deaths could be prevented with adequate medical care. • Providing all women and their newborns with the services they need at the standards recommended by WHO would result in major health gains. • If all unmet need for modern contraception in Asia were satisfied, there would be a large decline of about three-quarters in the annual number of unintended pregnancies (from 52 million to 13 million per year), unplanned births (from 13 million to three million) and abortions (from 33 million to eight million). • If full provision of modern contraception were combined with adequate care for all pregnant women and newborns, maternal deaths would drop by 72% (from 90,000 to 25,000 per year), and newborn deaths would drop by 77% (from 1.5 million to 328,000 per year). • Long-term benefits from meeting women’s contraceptive and maternal and newborn health needs include improvements in women’s educational attainment, labor-force participation, productivity and earnings, as well as increases in household savings and assets. • Currently, these services cost an estimated $18.6 billion annually in Asia—$3.7 billion for contraceptive services and $14.9 billion for maternal and newborn health care. • Meeting all women’s needs for modern contraception in Asia would cost $5.5 billion annually, an increase of $1.9 billion from the current costs. This additional investment would provide improved quality of care for current users, as well as coverage for new contraceptive users. 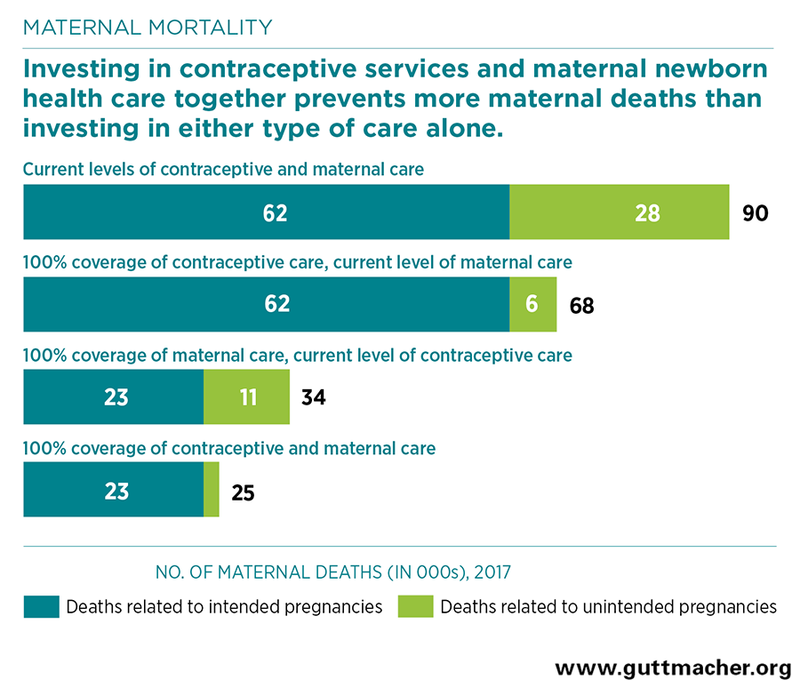 • In the absence of this additional investment in contraceptive services, fully meeting the current need for maternal and newborn care would cost $23.5 billion annually. • However, fully satisfying women’s need for modern contraception would lower these pregnancy-related costs by $4.3 billion, to $19.2 billion. This is because reducing unintended pregnancies means fewer women and newborns will require care, and this makes other health care investments more affordable. • More specifically, each additional dollar spent on providing contraceptive services in Asia would reduce the cost of maternal and newborn health care by $2.30. • Fully meeting women’s needs for both contraceptive services and maternal and newborn health care in Asia would cost a total of $24.7 billion per year, a 33% increase over current costs. • It would cost $5.67 per person per year to fully meet the need for both modern contraception and maternal and newborn care in Asia. • Governments, donors, NGOs, households and individuals all need to contribute to closing the funding gap to improve and expand contraception and maternal and newborn health services for all those in need. • Contraceptive and maternal and newborn health programs should adopt a human rights approach to health care delivery, which takes into account the particular needs of poor and marginalized groups, ensures quality of care, protects privacy, promotes informed and voluntary choice, and is free from discrimination and coercion. • As governments and international agencies seek to fulfill their commitments to meeting Sustainable Development Goals by 2030, they should address the need for greater attention to and investments in contraceptive and maternal and newborn health services. These investments save money; have enormous benefits for women, families and society; and are cornerstones of sustainable development. *As defined by the UN Population Division, this region comprises Central Asia, Eastern Asia (except Japan), Oceania (except Australia and New Zealand), Southeast Asia, Southern Asia and Western Asia.